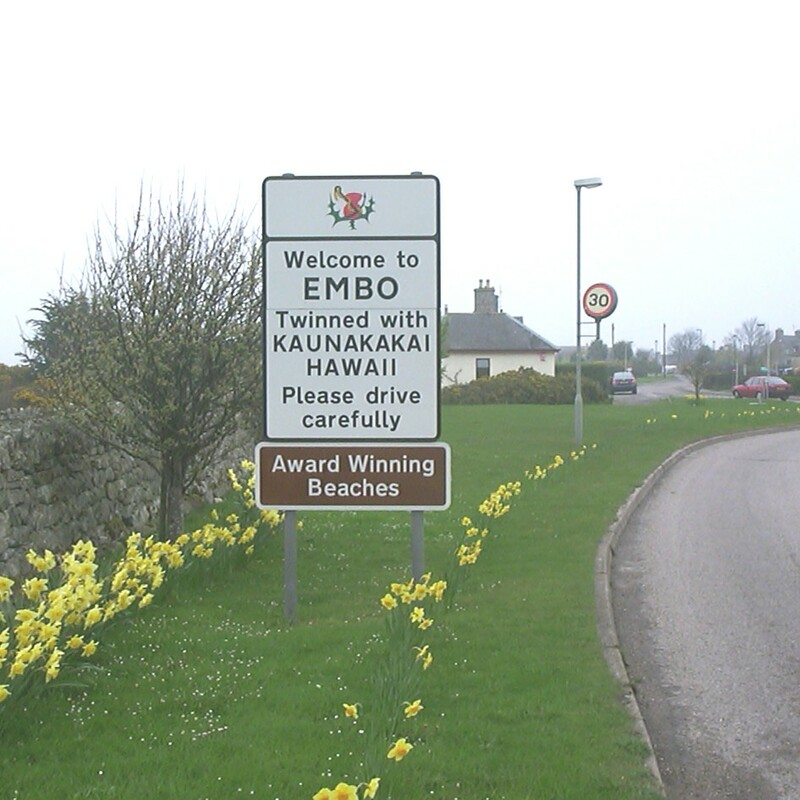 Embo is a beautiful little former fishing village situated on the Dornoch Firth in Sutherland amid some of the most magnificent scenery in Scotland. Most houses in Embo face south over the Dornoch Firth as the village is magnificently situated in the shadow of Ben Bhraggie with nice views of Dunrobin Castle to the north and Portmahomack and Ross-shire to the south. Dornoch, with its world-famous golf courses, is an easy stroll along the beach from Embo while a walk in the other direction leads to the impressive Loch Fleet nature reserve with its resident seals and wide variety of birds and wildlife. A school of dolphins can also be occasionally spotted as they frolic in the sea at Embo. Embo attracted nationwide attention on July 16, 1988, when it organised an "Independence Day" from the rest of the world. Mr Donald Ward was made Prime Minister for the day and the national anthem "Embos Golden Shore" was performed by North Sea Gas. Grannie's Heilan Hame, a spacious caravan and camping site run by Parkdean Holidays, lies adjacent to Embo and more accommodation is available in the village or nearby crofts. Dornoch, of course, has a wide selection of hotels and guest houses. Mackays Stores and Post Office serves the needs of villagers and holidaymakers alike while the "Grannies" complex also has a shop and lounge bar open to all during the season. Dornoch and Golspie, where major road and rail connections can be made to the rest of Scotland, are nearby. Car drivers are spoilt for choice with the magnificent Sutherland scenery on their doorstep and John o' Groats is only 77 miles north of Embo.